Samsung mixed things up this year by announcing the Galaxy S10 in San Francisco instead of the usual Mobile World Congress event. Though not unprecedented, the big reason here for the change in venues was to reflect Samsung's close collaboration with US carriers such as Verizon on 5G and other matters. Indeed 5G has been pretty much the buzzword for the last year or more, and the last few months have been especially busy in this regard. To that end, there will be a 5G model of the S10, however with its limited availability it doesn’t have nearly the same mass-market appeal as the new mainstream variants of the Galaxy 10. Today we’ll be reviewing the lead member of the Galaxy S10 family, the Galaxy S10+. And in true AnandTech tradition, we're going to look at both variants of Samsung's king of phones: the North American Snapdragon 855 model, as well as the European Exynos 9820 model. With Samsung using different SoCs for what are otherwise (nearly) identical phones, this gives us a unique opportunity to take an in-depth look at the two new processors and compare & contrast them under very similar circumstances. And of course, there's a great deal to dig into with the Galaxy S10’s new screen and triple-module camera setup. This is going to be a long piece so prepare yourselves! 3000mAh (11.55Wh) rated 3400mAh (13.09Wh) typ. 3300mAh (12.71Wh) rated 4100mAh (15.78Wh) typ. 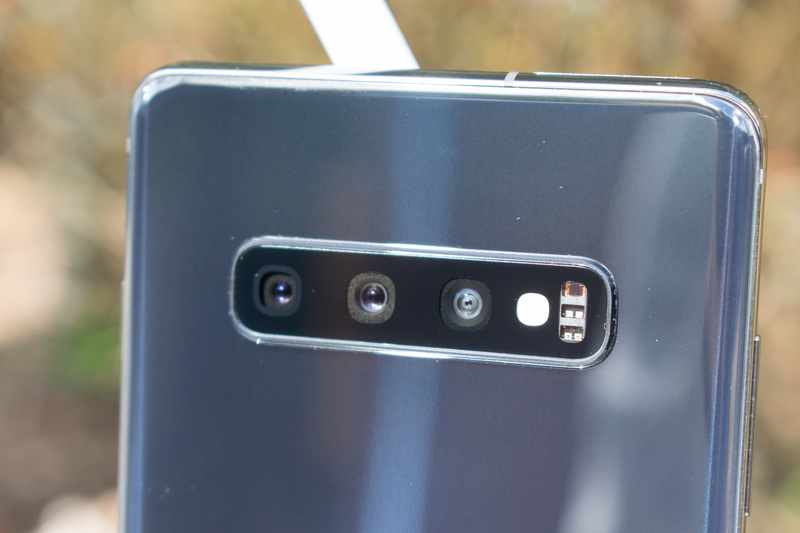 For the cameras, the Galaxy S10+ incorporates much improved processing as well as support for high dynamic range image capture. And this time around Samsung doesn't include just one or two camera modules, but instead the company has moved up to three rear cameras for their flagship smartphone. Altogether the phone now uses a trifecta of wide angle, regular main, and telephoto modules. The Galaxy S10 mainline series comes in 3 models: the Galaxy S10e, the regular Galaxy S10, and the up-sized Galaxy S10+. With Samsung offering so many phone variations – 6 in all – we've decided to dedicate our coverage to just a single model. 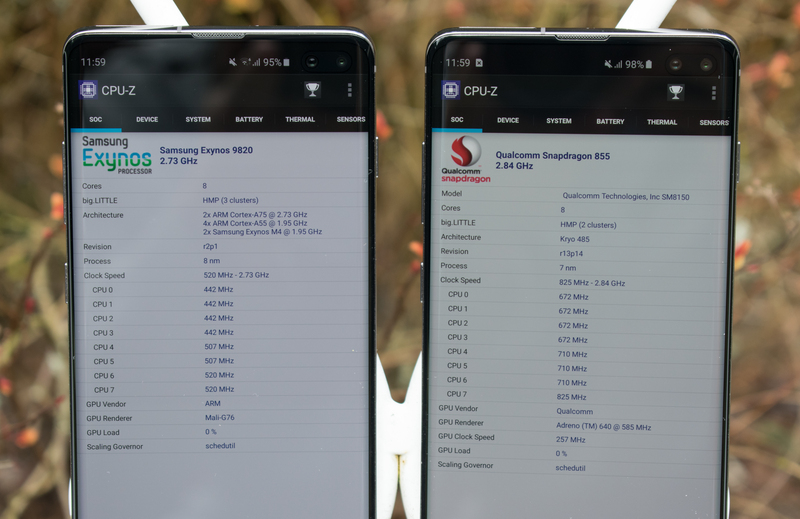 To that end, out of popular demand following last year’s review of the Galaxy S9, we've opted to focus on the headliner Galaxy S10+, taking a look at Samsung's big flagship and the Exynos and Snapdragon versions that it's comprised of. The challenge for S.LSI (and the new Exynos in particular) is daunting: HiSilicon launched their Kirin 980 SoC nearly six months ago, taking the lead in delivering the first Android SoC built on TSMC’s 7nm manufacturing node. Thanks to its process advantage and Arm’s impressive new Cortex-A76 CPU core, HiSilicon was able to deliver significant performance and power efficiency gains, which we've seen first-hand in devices powered by the new chip. On paper then, the Snapdragon 855 is quite similar to the HiSilicon chip in terms of CPU design and manufacturing technologies, and our first results back in January pointed out to similar great performance and efficiency gains. Moving on, let's talk about RAM and storage. The base configurations for the Galaxy S10 and S10+ come with 8GB of LPDDR4X DRAM, while the S10e starts at 6GB, so no phone at any tier is starting short on RAM. What is also great is that Samsung has phased out the 64GB storage tier for this generation, meaning that all S10 models come with at least 128GB of storage. I think this is a pretty important aspect of the value proposition Samsung is making with the Galaxy S10’s base configurations, as it contrasts very favorably against Apple's stingy storage tiers, which sees all of its iPhone configurations start at just 64GB, with the higher-tier 256GB models costing an extra $150. Going up to higher capacity configurations, the S10e also comes in a 256GB configuration that includes an extra 2GB of DRAM, all of which tacks another $100 on to the price tag. Meanwhile the S10 and S10+ can jump from 128GB of storage to 512GB for an extra $250. And finally at the top, the S10+ is available in an ultra-premium configuration that sports 12GB of DRAM, 1TB of NAND storage, and a ceramic back, for which Samsung is charging a $0 premium over the base configuration. Another notable change in internal specifications from generation to generation has been the increased battery capacities. The new Galaxy S10 comes advertised with a new 3400mAh battery while the S10+ claims a 4100mAh unit. I say "advertised" here because Samsung is being a bit misleading with their numbers; for the new phones Samsung’s has shifted from listing the design capacity of the batteries to their typical capacity, which inflates the numbers some. Sticking with the more traditional design capacity then, the Galaxy S10 and S10+ would be rated for 3300mAh and 4000mAh respectively. Which compared to Samsung's last-generation phones, is still a 10% and 14.2% increase respectively over the Galaxy S9 and S9+. In practice, the nominal capacity (actual usable cycle capacity) for one of my S10+ units shows up as 3891mAh, which as it happens is higher than even the 3747mAh showcased on my Note9. Along with the capacity changes, Samsung seems to have also changed their battery chemistry or charging behaviour, as the PMIC is now programmed to reduce its charge capacity and voltage at 300 cycles instead of 0 cycles. Similarly, the degradation curve appears to have been delayed, and it now reaches a lower 0% of the battery's design capacity after 700 cycles instead of 300. The degradation curves had been rather consistent for a few generations, so it’s interesting to see such a big change in the S10, and it's something to keep an eye on in the next year or two of usage. Relative to the S9, the main and telephoto modules in the S10 haven't changed in terms of their official specifications: they are still 12MP sensors, one with a f/2.4 2x zoom / 45° FoV lens and 1µm pixel pitch sensor, the other with Samsung’s dual-aperture f/1.5 or f/2.4 main module with 77° FoV and a 1.4µm dual pixel PDAF sensor. It’s to be noted that the S10 adopts new sensors for both these modules, even though their specifications on paper remain seemingly the same as on the S9. Added to the duo is the new 16MP f/2.2 1µm pixel pitch 123° wide angle unit, which gives the new Galaxy S10 a new perspective on the world.